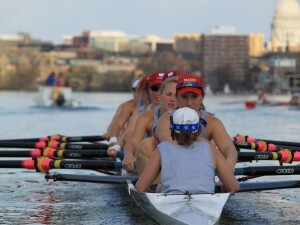 INDIANAPOLIS — The Ohio State University claimed the top spot in the first USRowing/Collegiate Rowing Coaches Association NCAA Division I Varsity Eight Coaches Poll of the regular season, while Western Washington University and Colby College topped the Division II and Division III polls, respectively. 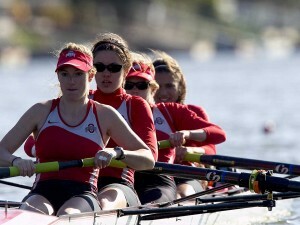 In Division I, Ohio State earned 10 first-place votes and moved up from its No. 9 preseason ranking to the top position. The University of California at Berkeley also made a big jump in the poll, moving from preseason No. 11 to the second spot. California received two first-place votes. Princeton University maintained its No. 3 ranking, while Michigan (two first-place votes) and Harvard (three first-place votes) ranked fourth and fifth, respectively. Seventh ranked Yale University also received three first-place votes. Western Washington was the unanimous choice in the Division II preseason poll and kept the top spot in the first regular season poll, earning five of six first-place votes. Mercyhurst College and Humboldt State University tied for second, while fourth-ranked Florida Tech received the other first-place vote. In the Division III poll, Colby College earned seven first-place votes to take the top spot in the poll. The United States Coast Guard Academy (three first-place votes) ranked second. Smith College, Ithaca College, and Williams College rounded out the top five. Not Ranked But Receiving Votes: University of Wisconsin 21, University of Iowa 18, University of Minnesota 14, Oregon State University 8, University of Pennsylvania 8, Boston College 2, Clemson University 2, and University of California at Los Angeles 2. Not Ranked But Receiving Votes: Barry University 6, University of California at San Diego 3. Not Ranked But Receiving Votes: Tufts University 37, Marietta College 32, Pacific Lutheran University 27, Willamette University 25, Rochester Institute of Technology 15, Bates College 13, and Wesleyan University 6.